After that huge headache that was Mum's Cursed Scarf, I now can't stop knitting! If you couldn't tell, I was in a bit of a knitting slump since the return from NH. I totally blame the Cursed Scarf. But now... I can't stop! Maybe it's the fact that the item will be functional and worn a lot! 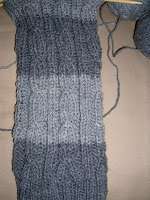 I'll give more details about the pattern and yarn soon. 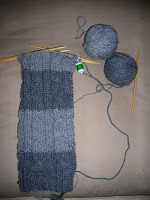 I just cant' stop knitting it! I wanted to give you a sneak peak now so I can go back to knitting! My goal is to finish it this weekend. Wish me luck! I'm guessing leg warmers or gauntlets. Heavenly and Uber Warm Leg Warmers!